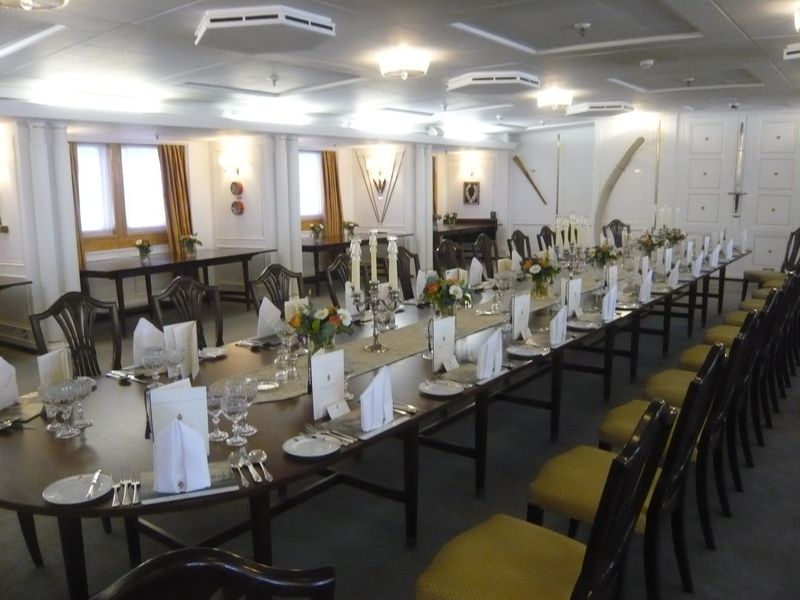 The royal yacht “Britannia” was in active use from 1954 to 1997. 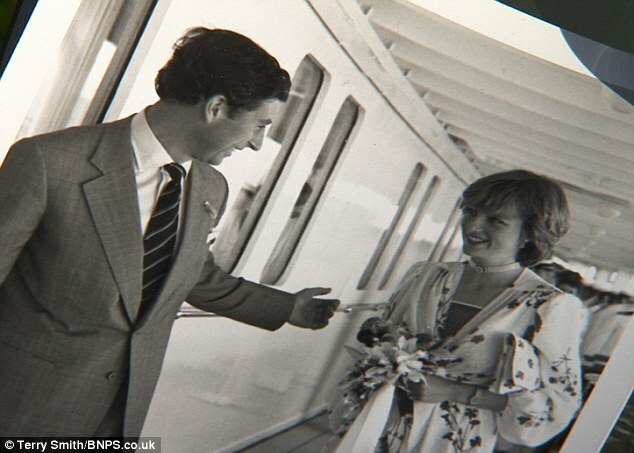 That made it available for the now-notorious honeymoon of Charles, Prince of Wales, and his bride, Diana Spencer, in 1981. From the published photos, all looked blissful. But as we all know many years later, trouble was already brewing in the royal marriage. 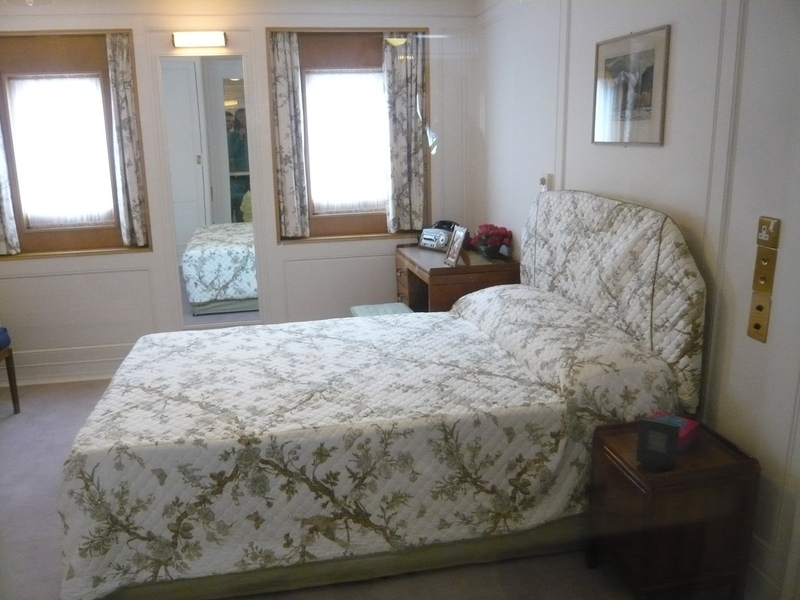 The young couple had the use of the only two-person bed on the yacht, in what was usually used as a guest room for distinguished visitors. I think the matrimonial bed was–dare I say it?–queen-sized. Crew members made do with narrow triple-stacked bunks far down in the bowels of the ship. Still, serving on the Royal Yacht was a plum position in the British Royal Navy. Crew members got to rub shoulders with royalty. During her honeymoon, a sometimes-bored Diana hung out belowdecks with sailors, all of them no doubt starstruck by the charming and beautiful 20-year-old princess. The fictional spy James Bond is “officially” a commander in the Royal Navy–an indication of the very high status of the British Navy, to this day. I wonder how he would feel about serving the Princess of Wales with “half a shandy” from the officer’s mess? I can’t imagine it. Instead, I’m sure he would wangle an invitation to dine with royals in the formal dining room onboard. After dinner, Mr. 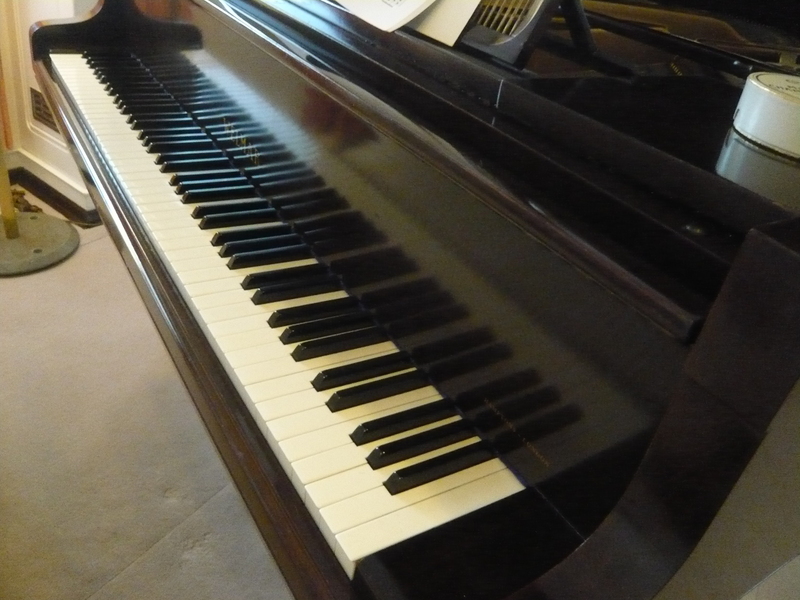 Bond might suavely lean on the grand piano in the salon, listening to the young Princess play. Was she any good? I guess we’ll never know. I wish she were alive to see how her sons turned out. Actually, I wish she were alive just for her own sake. 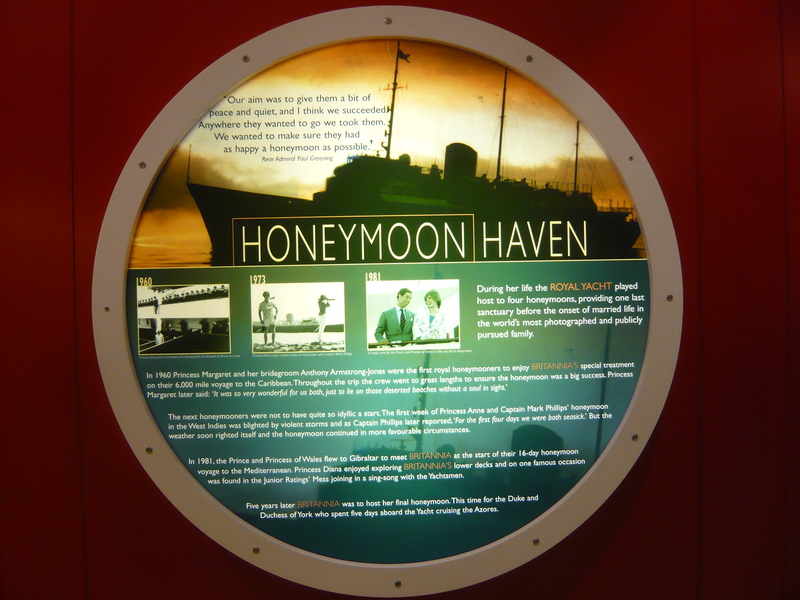 The sailors who served the royal couple were given access to a set of photographs of the honeymoon. Some of them were only recently published. Join me next time for more explorations into the art and the fascinating history of Europe and the British Isles! This entry was posted in British Isles, England, Historical Figures and tagged Britannia royal yacht, British Navy, James Bond, Prince Charles, Princess Diana on March 7, 2015 by Claudia Suzan Carley. The American press took up a lot of the pavement space in front of the hospital where the new Prince of Cambridge was born this week. Why our fascination with British royalty? Following is my own very personal and opinionated list of reasons. 1. We’re safe from a monarchy ourselves, having gained our independence 237 years ago. We get to enjoy the spectacle without paying the bills. 2. Nowhere in the world is the tension between the antique and the modern more visible than in the traditions of the British Royal Family. Prince William in the velvet and ostrich feathers of the ancient Order of the Garter? Irresistible, at least to many of us. To read about the 2013 Garter Ceremony, go to http://www.dailymail.co.uk/femail/article-2343223/Beaming-Queen-flanked-Charles-William-Order-Garter-today-Duke-Edinburgh-recovers-home.html. 3. We won’t admit we’re a little envious. But we’re both dreading and secretly anticipating the day the royals trip themselves up and create another riveting story like the Charles and Diana Show of the 1990s. 4. We have a new appreciation for Princess Diana, who, in spite of all her colorful personal failings, gave the British Monarchy a well-deserved kick in the pants. 5. We’re embarrassed about the media “royalty” we create for ourselves: overpaid sports heroes shown to cheat by taking banned substances, dysfunctional families like the Kardashians who cynically exploit their fame, reality “stars” who waste our time with their lame antics. Is this the best we can do, 237 years after getting British royalty out of our lives? 6. We love our dogs. We have to admire a Queen who is able to keep as many dogs as she wants. Besides the much-photographed corgis, the Queen reportedly keeps any number of cocker spaniels and dorgis—a corgi-dachshund mix. (No doubt there are also kennels full of dogs used for hunting, but these days hunting is kept on the down-low because of public disapproval). 7. We’re looking for stories of redemption. Queen Elizabeth II appeared to be a classic coldhearted mother, especially to Prince Charles, but (if you ask me) she redeemed herself in the moment during Diana’s funeral procession when she briefly bowed her head as the coffin passed. We’d like to think the Queen has learned her lesson and became a better parent from that day forward. We especially like telling ourselves that a Queen NEEDS to be humbled once in awhile. 8. The current crop of royals shows signs of having more good sense than greed. I was won over when William and Kate asked for charity donations rather than wedding gifts. 9. We appreciate good PR, especially when it does not seem like PR. When Kate was photographed pushing her own grocery cart a few days after the Wedding of the Century, that was great PR–and we all knew she had been shopping for her own groceries for years. When Prince William personally placed the new baby’s car seat in the royal Land Rover and drove off with his expanded family, that was great PR. Commenting that the baby had more hair than his prematurely-balding dad was frosting on the cake. 10. We’d like to think that if we were born to untold wealth that we did nothing to deserve, we’d behave humbly and generously. William and Kate appear to be doing just that. And they’re making it look easy. If the British Monarchy survives this century, I think people will look back on the personalities and events of the past few years as the reason. Join me next time for more explorations into the history of Europe and the British Isles–even as history is being made before our eyes! 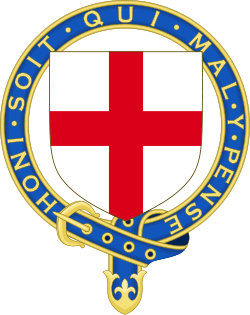 This entry was posted in British Isles, England, Uncategorized and tagged American fascination with British Royal Family, American reality shows, Duchess of Cambridge, Duke of Cambridge, Kardashians, new royal heir, Order of the Garter, Prince Charles, Prince of Cambridge, Prince William, Princess Diana, public disapproval of hunting in UK, Queen Elizabeth II, Queen Elizabeth II as parent, Queen's cocker spaniels, Queen's corgis, Queen's dorgis on July 24, 2013 by Claudia Suzan Carley.